When storing the mower at the end of the season, it is a good practice to empty the mower gas tank. This prevents sediment from building up in the fuel system and also prevents leaks in the lines. Draining the lawn mower gas tank is only one part of draining the fuel from the mower. Fuel is also inside the carburetor and the fuel lines. A hand siphon is the cleanest way to drain the lawn mower gas tank. You can buy hand siphons at home improvement centers. Push the lawn mower to a level spot. Place a the refueling gas can near the lawn mower, and open the fuel tank fill cap. Insert the straight portion of the hand siphon into the mower fuel tank, and insert the flex hose of the hand siphon into the refueling gas can. Squeeze and release the bulb on the top of the hand siphon to siphon the gas from the mower into the gas can. Remove the hand siphon when all the fuel is out of the mower fuel tank. Find the carburetor bowl drain under the carburetor, if your mower uses a bowl drain. The bowl drain resembles a small cup with a screw slightly off-center on the bottom. Position a plastic cup under the screw of the bowl drain. Loosen the screw with a wrench and allow the small amount of fuel to drain into the cup. Tighten the screw and empty the cup of fuel into the gas can. 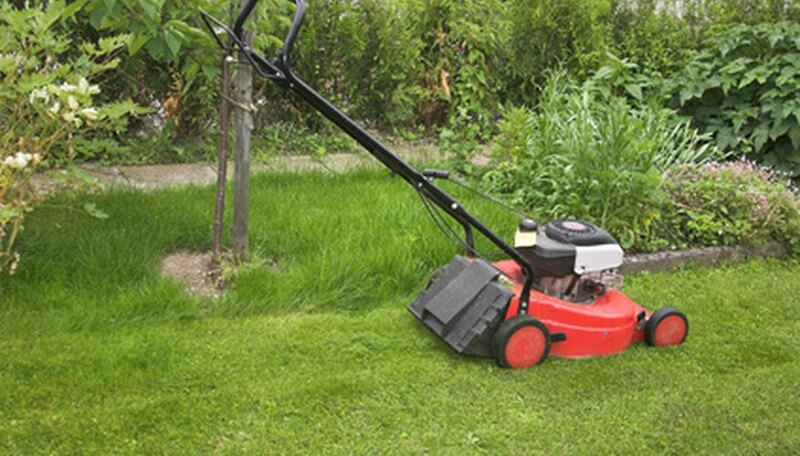 Start the lawn mower and allow the mower to run until it shuts itself off. This will remove any fuel remaining in the lines.